June 10, 2016 4 comments on "Canning Rose Petal Jelly"
I have been experimenting with new jams and jellies during the past year. I’ve always wanted to try making jelly from edible flowers, so this year I decided to try making canning rose petal jelly from fresh rose petals. (If you are wondering what the difference is between rose petal jelly and rose petal jam, rose petal jam still has the rose petals in it. The jelly is clear and does not contain any rose petals. It might sound weird to eat rose petals, but it’s actually really good! Get my rose petal jam recipe. You can make jelly from any kind of rose petals as long as they have not been treated with any type of pesticides. If you are able to hike around in the countryside, that is the best place to find wild rose petals, and they have the most aromatic scent. If you are wondering how rose petal jelly tastes, it tastes just like roses smell! You most likely will love it or hate it. I really enjoyed the floral taste of it. It would be great on biscuits for a ladies’ tea. Wash and sterilize your jars, lids, and screw bands. The easiest way to do this is run them through the sanitize cycle in the dishwasher and remove them from the dishwasher to use when they are still hot. Place your boiling water canner on the stove to start heating up while you get the fruit ready for the jars. Use only fresh rose petals that have not been treated with any pesticides. Snip off the white ends of the petals with clean kitchen scissors. Place rose petals and water in a stock pot. Bring to a boil. Remove from heat and let sit for 10 minutes. Pour the liquid through a fine mesh strainer. Add lemon juice to liquid. Liquid will change color to match the original color of the flowers (no food coloring necessary!). Add liquid if necessary to equal 3 cups. Return liquid to stock pot. Stir in the pectin. Bring to a rolling boil that cannot be stirred down. Stir in sugar. Add 1 tsp. margarine or butter to reduce foaming, if desired. Bring to a full rolling boil (a boil that doesn’t stop bubbling when stirred) on high heat. Boil exactly 1 minute, stirring constantly. Remove from heat. Skim off any foam with a metal spoon. Quickly ladle jelly into prepared canning jars, within 1/4 inch from the tops of the jars. Wipe the rims of the jars with a damp cloth. Place canning lids and screw bands on the jars. Remove jars from canner and place upright on a towel on the kitchen counter to cool completely. After jars are cool, check seals by pressing middle of lid with finger. If lid springs back the lid is not sealed. Unsealed jars can be placed in refrigerator to be eaten in the next couple weeks. Sealed jars can be stored for at least 1 year. Enjoy! Yield: 3 pints or 6 half pints. 4 Comments on "Canning Rose Petal Jelly"
This recipe sounded so inviting! 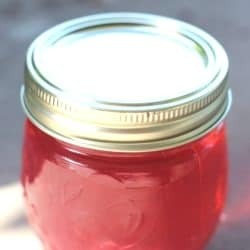 I am new at canning and tried the Rose Petal jelly. I used liquid pectin as I did not realize I could not substitute. It tastes great and looks beautiful but it did not set. Can I recook it using the crystals.? It is still warm but it is as runny as water. Can this be made with rose petals that I’ve harvested and dried? I know they are clean and free of pesticides and everything. Yes, you definitely could! The process for infusing the rose petals into the jelly is basically the same as making tea, so using dried petals should be fine. The only thing I’m not sure is if the jelly would still turn the color of the original roses. It’s worth a try though, the taste should be the same. You can always add a bit of food coloring if you want!